Foot and Leg Pain can be debilitating. The board-certified podiatric physicians at American Foot and Leg treat all types of arthritis that occur in the foot and ankle. They know it is a common disease which causes a lot of pain. In fact, it is the leading cause of disability in the U.S. More than 300,000 children and over 50 million adults suffer from the disease. The symptoms vary from mild to severe. Foot and ankle pain from arthritis can come and go or it may get worse over time. The worst cases can be debilitating. Sufferers have chronic pain and mobility is severely limited. And, the ability to perform normal activities and routine personal care is severely affected. Arthritis is not curable. At American Foot and Leg we strive to formulate individualized treatment protocols to relieve our patients’ suffering. Treatment can make life not just bearable but productive and relatively pain-free. When you come to American Foot and Leg we will ask you to fill out a medical history form to provide information about your symptoms and past medical history, including detailing any injuries. Your physician will examine your shoes and discuss any medications and supplements you are taking. Special tests for the feet include gait analysis and X-rays. The gait test measures stride, tests foot and ankle strength, and records how the bones in the leg and foot line up when walking. X-rays are valuable for diagnosing arthritis or other foot pain. They show the shape of the bones, the spacing between bones, and can reveal how severe the arthritis is. The exam may also involve a CT scan or MRI to evaluate your condition. After completing the evaluation and reviewing test findings, we will make a diagnosis and recommend a treatment plan. After middle age, cartilage wears out. When the surface of the ends of the bones becomes thin, swelling and inflammation set in and that is “Osteoarthritis.” This disease is often referred to as “wear and tear” arthritis because it is common in older folks. Obesity and family history also contribute to developing the disease. The pain related to this type of osteoarthritis gets worse over time. It’s important to seek treatment to slow the progression of the condition. 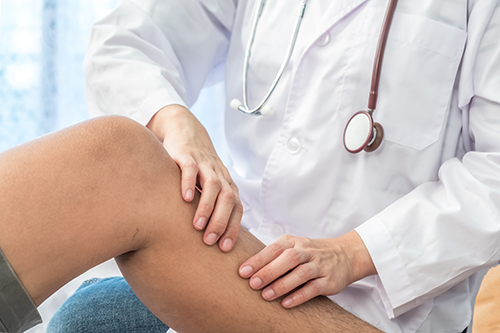 Another common condition doctors see at American Foot & Leg is Post-Traumatic Arthritis which develops after a fracture, severe sprain, or ligament damage. An injured joint is more likely to become arthritic even if it was treated. If the immune system attacks and destroys cartilage, rheumatoid arthritis is the cause. This system-wide disease can be painful. Non-surgical and surgical treatments for arthritis are available. The doctors at American Foot will discuss your options with you. They are highly-trained professionals who want to help relieve your pain and return to your normal activities. The feet and ankles are complicated. There are so many bones and joints in the foot and ankle held together by ligaments. If one joint goes bad, it can cause arthritis pain that takes its toll on the patient. If you are suffering from foot pain or swelling, contact American Foot and Leg for an appointment. There is a location close to you if you live anywhere south of Atlanta, GA. Cities such as Peachtree City, McDonough, Morrow, Newnan, Forest Park, Fairburn, and Stockbridge are convenient to American Foot locations.